Jared Unzipped: The Rising Tide of E-Cigarette Use By Teenagers. In a shocking bit of news today, the Centers for Disease Control revealed that the use of electronic cigarettes by middle and high school students tripled between 2013 and 2014. The statistics show that the percentage of students using e-cigarettes in the United States jumped from 4.5% in 2013 to a whopping 13.4% in 2014. While the number of underage tobacco users has largely remained unchanged in recent years (currently around an absurd 30%), the use of electronic cigarettes and vaporizers has moved along at warp speed. This is unheard of in other developed societies. Much less, the damage that nicotine can do to a developing mind is well documented. Nicotine has a degrading influence on the prefrontal cortex of the brain, which directly alters the decision making process. Teens who consume nicotine, in any capacity, lessen their ability to make wise decisions. There's another downside to the consumption of electronic cigarettes, which function by vaporizing liquid nicotine. Often mixed in with the liquid nicotine are various flavors and additives. Unfortunately, we just can't be certain exactly what's in this nicotine cocktail because electronic cigarettes are completely unregulated. The various liquids, which typically originate from countries like India and China, usually do not indicate what ingredients are included. Yet, chemical analysis has shown that such harmful chemicals as DDT have been found present in the liquid nicotine that's currently available at retail. Personally, I find the use of electronic cigarettes to be just as foolish as smoking regular cigarettes -- you're trading one set of bad chemicals for another. Much less, no long term studies have been conducted on the use of electronic cigarettes or the vapor that's exhaled by users. It's a dangerous and all-around uninformed choice to be inhaling unknown chemicals from places that could give a damn about the safety of their products. This negatively affects teenage users worst of all. They'll have a lifetime to contend with any possible negative health impacts from the use of liquid nicotine. Never mind the assertions of pro-vaporizing lobby groups, which contend that the use of electronic cigarettes is completely healthy. Appallingly, medical doctors regularly prescribed the use of tobacco for their patients on into the middle part of the Twentieth Century. 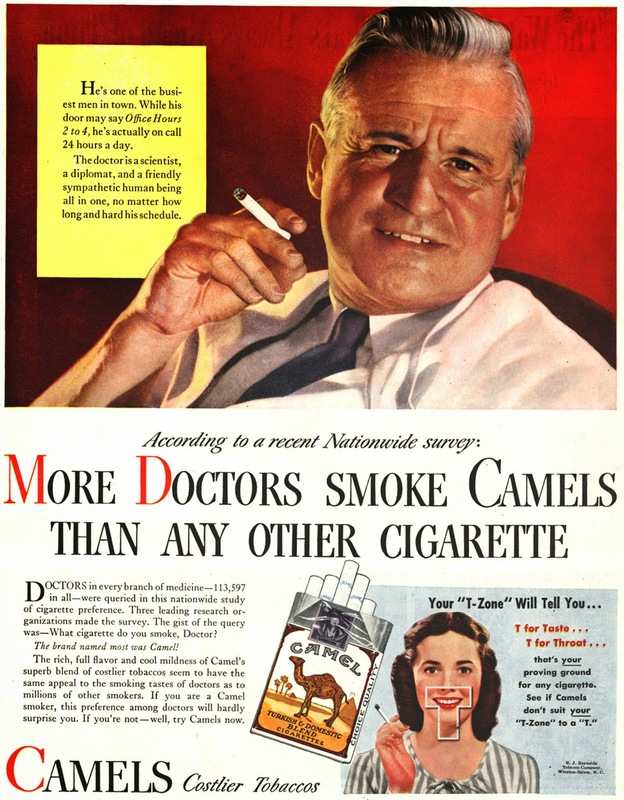 Advertisements for various cigarette brands even featured "expert claims" by doctors as to why their brands were completely safe. If Americans only knew then what we know now -- smoking will kill you. Should we not apply this same cautious logic to the use of electronic cigarettes? An authentic, vintage Camel Cigarette ad from the mid twentieth century. The ability of the federal government to regulate the sale and use of electronic cigarettes as soon as possible isn't just a matter of public safety -- it's about preserving the lives of youth. Modern student health programs should educate about the dangers of nicotine and tobacco use, including the consumption of liquid nicotine and e-cigarettes. Ultimately, I'd hope for the end of nicotine abuse globally, though that notion is surely far from being a reality. Yet, we have to start somewhere. 1. Do you have any evidence to show that the electronic cigarette oils/liquids are safe? 2. Using one of those kits, will the user eventually be free from all smoking (traditional/electronic)? I must say that e-cigarettes are just best to fulfill your smoking desires, without any side effects. Thanks!! If you have any scientific research to support your claim, I would enjoy hearing it. People are searching for alternative option for smoking. vaping is the best option for real smokers. Best Electronic Cigarettes Australia products actually not effect to the health. What a quick nice read! Surely its eye opener to most of the parents who do care about their young children who just started their high schools. Keep us all posted Jared !